After a long hectic day, we all need that good night’s sleep to recharge ourselves for the next day. However, not everyone is blessed to get good sound sleep easily. While some face this every single night probably due to some disease and needs medical help, for most of us the problem is not clinical. What really happens is that, no matter when you close your eyes and try to sleep at night, you simply cannot fall asleep easily. Instead, the situation worsens and you will feel frustrated that further hampers the quality of sleep. Then when you finally fall asleep, it gets late and you hardly get any proper sleep especially if you have to get up early in the morning. I have myself faced this problem often and have heard many complaining about similar sleep issues. Thankfully, I have found out ways to combat the sleep issues and it has worked wonderfully in my case. So, if you also are a victim to this and desperately wants some solution to fall asleep after hitting the bed, then here’s the post worth checking. Today I am sharing the list of top 21 of my favorite ways that helped me fall asleep naturally and get good quality sleep every night. These tricks have worked for me and I am sure they will not disappoint you. Inadequate sleep has many side effects with the immediate effect being the constant dizziness or fatigue feeling that an individual experiences. And, if it continues for long, it can take a severe toll on your well being. Therefore, sleep is something very important to remain fit and healthy. While infants need long hours of sleep, a full-grown adult needs 7-8 hours of sleep on an average basis. 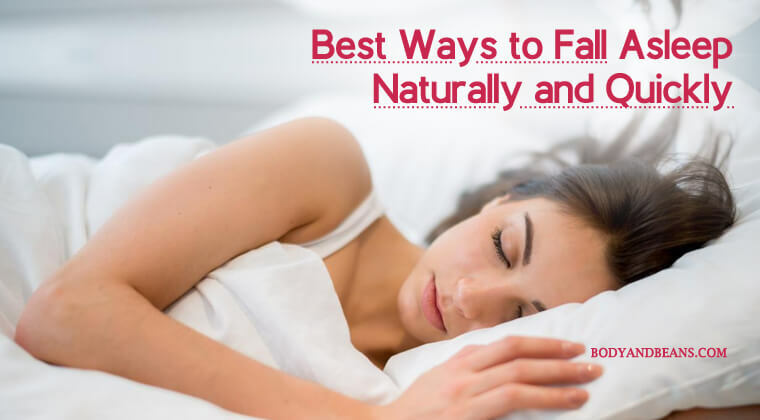 If you experience difficulty to fall asleep for 1-2 days, it is ok but if things get more and more common with each passing night, then it’s time for you to contact a doctor as well as follow some easy and cool tips to fall asleep naturally and easily. To help you out, I have listed some easy but effective tips to fall asleep easily that will help you to fall asleep quickly and easily after hitting the bed at night. I will be talking about the coolest tips to fall asleep easily but before that let us discuss on some of the main factors that obstruct you from having a perfect night’s sleep. The factors that interrupt you from getting a good night’s sleep is not one but many. While some has clinical connections, others might be changed with some cool techniques. So below mentioned are some of the most common factors that hinder your sleep. It is good to know the reasons in order to get the perfect solution. Now that you have known the various causes, let’s start with the various easy tips to fall asleep naturally and easily. Sleeping pills are never a solution to sleep problems until and unless doctors recommend them. It is always preferable to use natural techniques to get rid of your problems and so you can try out some of these tips to fall asleep naturally and quickly. These are indeed unique tips and most of them are scientifically proven to help you fall asleep. Some of these tricks have worked well for me and I am sure it’s going to help you as well. Individuals who do not maintain proper sleep timings tend to be more prone to sleep problems than those who maintain proper sleep routine. By proper sleep routine, I mean a fixed sleeping and waking time that must be followed even during holidays and in weekends. An adult requires minimum 7-8 hours of proper sleep and if you go to sleep and wake up on a fixed time, your mind and body will get accustomed to that and you will have no difficulty falling asleep. I myself follow this simple sleeping rule and it definitely tops my list of the best tips to fall asleep easily. Confused? Well, yes, this is reverse psychology and it works for many. Scientific research has shown that insomniacs who were told to remain awake for long tend to fall asleep faster than the ones who were said to fall asleep fast. This is a really interesting phenomenon as in most cases, the sleep problems are psychological. So the next time you face difficulty to sleep, just try keeping your eyes open for long and see whether it works on your case. Yes, yes, hide your clock when you go to sleep. This is very important as it distracts you from falling asleep fast. If you are unable to fall asleep at night and constantly check out the time passing by, it will only increase your stress. You will get more worried about not falling asleep when time is running and that thought itself will not let you fall sleep fast. So try to hide the cloth or keep it in a position where you are facing your back probably. If you face difficulty while sleeping, then probably the environment is not suiting you. Try to keep your bedroom cool and dark while you sleep. The recommended temperature favorable to sleep is somewhere between 60-67 degree Fahrenheit, so you can definitely adjust your room temperature according to that. Darkness is equally important as it signals the brain that it is time to sleep and get some rest. It produces melatonin that cools the internal body temperature and you automatically fall asleep. An individual falls asleep within 15 minutes of lying down on an average basis. But if you have difficulty in that, then get up, do some work (related to brain or hands) and then go to sleep again. This particular technique has worked for me, and I am sure it will help you as well. You may take a warm shower one hour before going to bed. This is because lukewarm water will make your body warm and when you enter into the cooler environment of your bedroom, it will allow the temperature of your body to reduce precipitously. This rapid change in temperature slow down your body’s metabolism faster that makes your body prepared to fall asleep. So, make it a habit to take warm showers every night an hour before going to bed and then enjoy a sound sleep at night. According to a study published in the journal “Nature”, warm feet is instrumental in inducing sleep. In this experiment, individuals were asked to keep hot water bottle at their feet. This mechanism increased heat loss by widening the blood vessels found on the skin surface. It was seen that the shift in the flow of blood from the core to the extremities cools your body and makes you fall asleep fast. You can easily wear socks before going to sleep to keep your feet warm as recommended by the “National Sleep Foundation” but if you feel too hot during summer then you may use some warm cloth to cover your feet. According to Dr. Andrew Weil, the “4-7-8” breathing technique is highly beneficial and has many health benefits with helping you fall asleep being one of them. This method increases the amount of oxygen in the blood stream, slows down heart rate, and releases much more carbon dioxide from the lungs. Thus, it is definitely one of the best ways to fall asleep faster. The technique is interesting. Here is how to do it. Studies have shown that aromatherapy works in inducing sleep and many fragrances with the special mention of lavender is really effective. This magical herb is instrumental in relaxing your nerves, lowering your blood pressure and makes you feel calm. Therefore, when you inhale the fragrance of lavender, it increases your amount of sleep and makes you feel lively in the morning. This therapy has worked for many. In fact, breathing it deeply is often associated with clearing your mind. So try this out and decide for yourself whether it works for you or not. The dinner you eat is important as it may interfere with the night’s sleep. It is preferable not to eat very rich, oily and spicy foods at night. This is because there is not sufficient time for your body to digest the food properly. You should therefore try to finish off your dinner minimum 1-2 hours before you go to bed. Also, try to incorporate foods that induce sleep in you. You may refer to a post of mine that I wrote specifically on this and get an idea regarding what to include and what to exclude in your dinner. As per studies, potassium has the ability to make you fall asleep faster and so you may eat avocados, milk, bananas, spinach etc. The other nutrients good to induce sleep are magnesium, carbohydrates, selenium, Vitamin D etc. The effect that caffeine has on your body varies from person to person but various studies have shown caffeine to be instrumental in keeping us awake late night. Generally, caffeine stays in body for minimum 8 hours, therefore it is advisable that you avoid or at least restrict your coffee intake or other things containing caffeine like black tea, hot cocoa etc from the evening. The doctors of the “Cleveland Clinic” recommend the intake of caffeine by 2 pm for all especially for the ones who face difficulty in falling asleep. So please drink coffee and other caffeine containing foods or drinks in the morning or noon. While you go to sleep, your mind gets bogged down with several worries that is one of the reasons behind late onset of sleep. But if you visualize a soothing environment or picture your favorite place in your mind, it is proved to be effective in inducing sleep. The imagery is relaxing to your mind that makes you calm and eventually you fall asleep. If you want to fall asleep fast, you need to check your sleeping position. In case, you sleep on your back, please try to change it. This posture increases the chances of sleep disorders like lower back pain and sleep apnea, which can cause difficulty in falling asleep. The best position is to sleep on your side. This lessens any occurrence of blockage in the airways. Therefore, this sleeping posture is advisable for all, but specially for the ones with heart problems and for women who are pregnant. The pillow you use is also instrumental in letting you fall asleep. Choosing a wrong one can highly disrupt your sleep and can also result in acute back and neck pain. Therefore, you must use a proper neck pillow that will allow you to keep your head in a straight line. You may also use two pillows, one for head and the other to keep between your knees. The pillow in between your knees will make your hips lay in neutral position. National Sleep Foundation has laid stress on bedroom elements as important factors in promoting sleep with a special mention of mattresses that play an important role in it. In fact, many researchers have confirmed the obvious link between good improved sleep with better mattress choices. So, if you experience sleep problems, immediately change your old, saggy, worn up mattress with a comfortable good quality one. This is indeed one of the best tips to fall asleep quickly. Try to wear comfortable soothing clothes while going to sleep as this helps in better regulation of your body temperature and hence help you in falling asleep faster. Therefore, every night before going to sleep, ditch your other heavy or harsh clothes and wear your favourite night dresses and enjoy a good night’s sleep. While loud music can hamper your sleep, listening to a soothing one can make you fall asleep easily. According to scientific research, students of age 19-28, when subjected to soothing classical music for 45 minutes before they went to bed, showed improvements in their quality of sleep. Therefore, you may listen to music with a slow rhythm of 60-80 beats per minute. This is one of the coolest ways to fall asleep and it can also deal with your problems of depression. Stress and anxiety is one of the leading reasons behind your poor sleep according to science, and controlling them will certainly be one of the greatest achievement by an individual in this respect. Although stress cannot be so easily controlled but research shows that meditation is one effective way of dealing with it. You may also rely on acupressure as it helps you combat stress and anxiety and release the stressed muscles from the pain and pressure. Moreover, using proper acupressure techniques can also help you get rid of insomnia. Research shows that a short nap of around 30 minutes reverses the health effects of poor sleep. However, if this daytime nap lasts for long, it will have adverse effect when you try to sleep at night. This is because it upsets your sleep cycle and causes you problems. So please avoid taking long naps during the day and in case you really feel tired, make sure you are not napping for more than 30 minutes. Exercises are good for health but heavy exercise late night may not be that beneficial for you. This is because they may have negative repercussions and interfere with your sleep. Late night exercise increases metabolic rate and your core body temperature, which may act as a hindrance for you to fall asleep fast. Therefore, as per research, it is best to do the exercises in the morning and maintain a proper exercise pattern for your mind and body to get accustomed to it. Whenever you are going to sleep, simply turn off all your electronic gadgets, be it your laptops, smartphones, T.V to video games etc. This is very important as using all these before sleeping is found to cause a lot of hindrances in making you fall asleep and research has shown it to be more common in adolescents. Although it is more common with schoolchildren and adolescents, the usage of late night electronics harshly affects the sleep quality of all of us. Therefore, it is recommended that you turn off your electronics and free yourself from all sorts of distractions while you go to sleep. This is one of the best hacks to fall asleep easily. A good night’s sleep is very important for your well-being. It keeps you recharged and active throughout the day. On the other hand, if you do not get proper night’s sleep, it simply hampers your day and health. Be it your constant feeling of fatigue to dozing off all through the day, inadequate night’s sleep is dam irritating. In fact, it creates a very negative impact on your mood as well and makes you quite impatient and aggressive at times. If you want to enjoy a proper sleep of minimum 7-8 hours at night, you need to be aware of the factors that lead to sleep problems. Although the reason may vary from person to person, you must know all of the common factors to find out the factor that is affecting you. I have jotted down the causes, some of which are clinical while others are mainly behavioral or environmental, those of which you may rectify with little diligence. Besides talking about the factors, I have given you a list of 21 best tricks to fall asleep easily and naturally. Most of these are tried, tested and are scientifically proven and hence can be declared safe. Little things like maintaining a good sleep routine, eating proper food, making a soothing sleeping environment, avoiding electronic gadgets while going to sleep, doing meditation to combat stress etc work wonders and are by far the best tricks to fall asleep faster. These remedies are natural and needs minimal effort on your part to get the benefits. You simply have to be honest enough to follow them every single night. Although most of us will benefit from my suggested tips to fall asleep easily, those suffering from diseases or severe sleep disorders like insomnia, sleep apnea, parasomnias, restless leg syndrome, narcolepsy etc. must take doctor’s advice. Do you suffer from sleep problems? Do you know the reason why you get inadequate sleep at night? Have you checked my recommended 21 tips to fall asleep easily? What is your take on the whole matter after knowing about the tips to fall asleep easily? Share me your feedback on the comment section and feel free to tell me your quarries or suggestions after reading my article. In case, you find the post interesting, please like and share with others. Until then try out the above-mentioned tips to fall asleep easily and decide their relevance in your life for yourself.